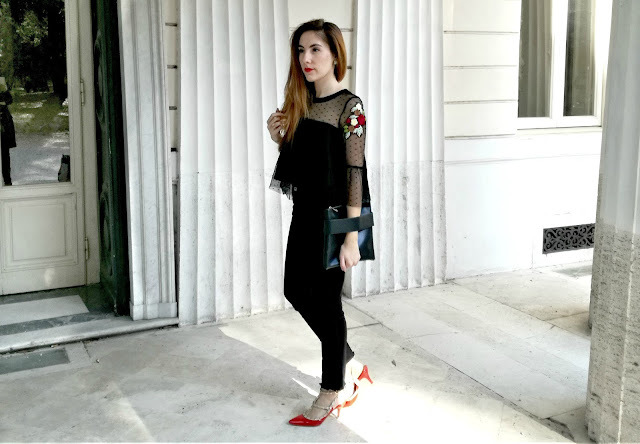 Have you ever wandered what to wear on a date night? 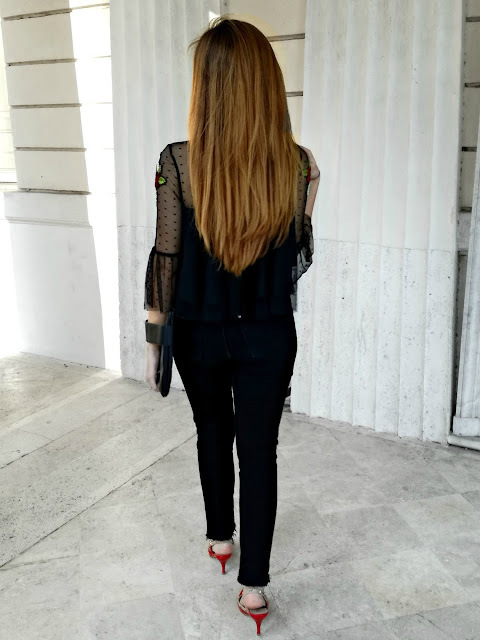 Today I want to share with you my casual but stylish date night outfit idea, that is all about black and red pop of colors. 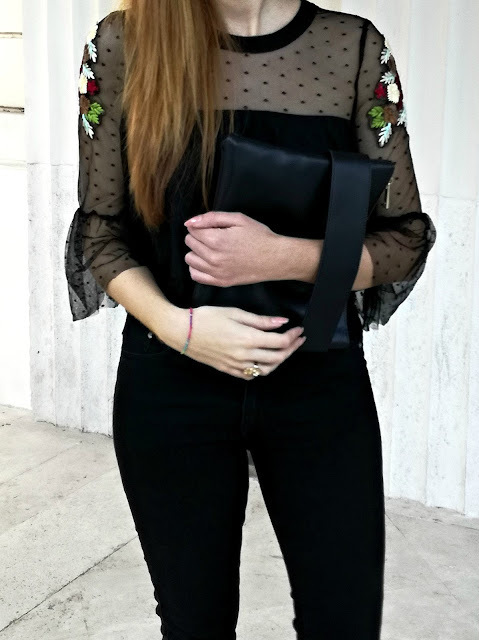 To achieve a relaxed but put together look I paired my favourite black skinny jeans with a flowly top with sheer details and floral embroideries. 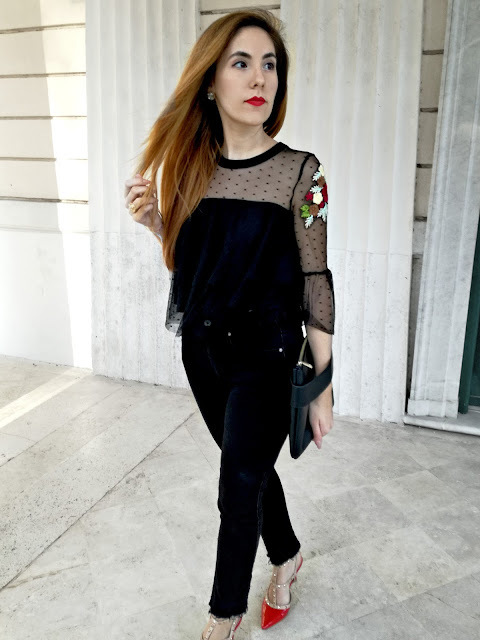 Then I decided to spice up the outfit with my Valentino Rockstud inspired red shoes that also match my vibrant lipstick and the embroidered flowers on my top. For accessories, I picked a simple geometric clutch and some minimal gold earrings. Let me know in the comments down below what do you think about my "Spring Date Night Look" and which are you must-have pieces for a night date. $40 off orders $200+) and refresh you wardrobe for S/S season! You look gorgeous in that black top, love the mesh details on top. you look absolutelly fabulous :D love your blouse and your shoes. amazing! enamorada totalmente de tus zapatos, me encantan! Really beautiful outfit, the blouse is awesome! Hello, thank you so much!! What wonderful and interesting outfit! Lovely pictures! Hello Carol, thank you so much! I like the date night look, casual but still cute and flirty. Thanks for stoping by my blog. I'll be following you on G+ and Instagram, hope you will follow me back as well!